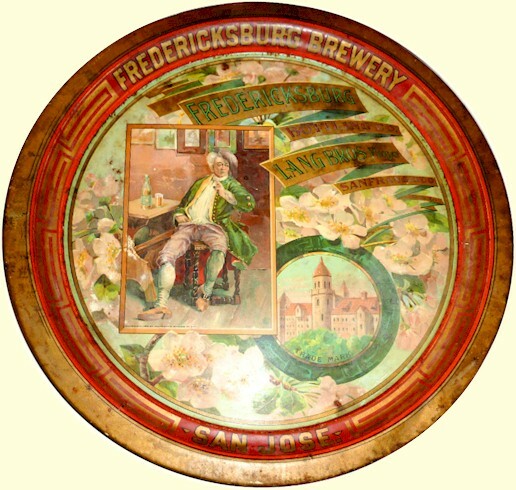 The history of the Fredericksburg Brewery from its founding in 1869 to 1881 is covered in a history of Santa Clara County, that follows. The period from 1881 to its reorganization as the Fredericksburg Brewing Company in 1889 is also covered, although briefly. The following is from the History of Santa Clara County, California, by J.P. Munro-Fraser. Alley, Bowen, & Co., 1881. "This, the most extensive and complete brewery in the county, if not in the State, was first established in the year 1869, by Fred Krahenberg, in a shanty, on the corner of Cinnabar street and the Alameda, where now stand the splendid fabric of Schnabel & Denicke. In 1870, Mr. Krahenberg admitted Alfred Recard into partnership, continuing the business in the original building. Mr. Recard sold out his share to Schramm & Schnabel, in 1872, and the style of the firm became Krahenberg & Co. In this year, a new brew and malt house, as well as other buildings were erected of brick, the dimensions of these being; malt house, one hundred by fifty feet; brew house and cellars one hundred and sixty by forty feet; and fermenting house supplied with all the latest improvements, eighty by forty feet; while the trade had increased to between four and five thousand barrels per year. In 1876, Mr. Kranhenberg disposed of his stock in the concern to Schramm & Schnabel, who gave their name of the firm, which it maintained until the month of April, 1880, when E. A. Denicke buying out Mr. Schramm, the designation of the co-partnership became Schnabel & Denicke, that which it now bears. The ground on which the Fredericksburg brewery is located has two artesian wells, of five hundred and twenty-one, and one hundred and seventy-five feet in-depth, the property occupying an area of two acres. Besides being supplied with a refrigerator, whereby ice may be manufactured, and water cooled to the necessary standard, it possesses a department for pitching kegs, under the Anheuser patent, as well as a thirty-five horse-power engine to drive the machinery. The barley used is entire the product of the Santa Clara valley, while the malt is wholly made on the premises. Last year, the fiscal year to May 1, 1880, the amount of beer sold was ten thousand, two hundred and one barrels, which found a ready market all over the Pacific coast, the Territories, and even in Mexico, and the expectation is that the year 1880-81 will see a production of fully twelve thousand barrels. 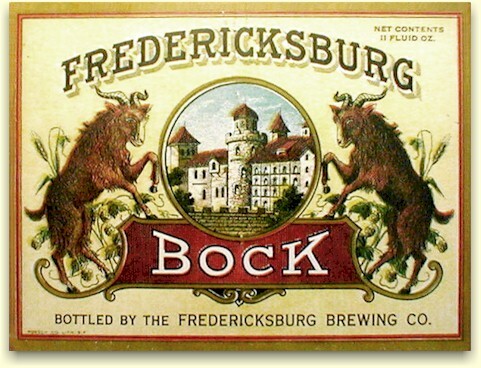 It is pleasant to record that the proprietors leave no stone unturned so that a pleasant and healthful beverage maybe produced; improvements are constantly being made so that the standard of the beer may be bettered, and the proof that it is so rectified is to be found in the annual increase in the manufacture, sale and consumption of Fredericksburg beer." The period of 1881 to 1888 saw continued growth and expansion, with Fredericksburg agencies and bottling depots established over many western states. The brewery was a lager beer producer from its inception, and brewed at least six styles of lager beer. 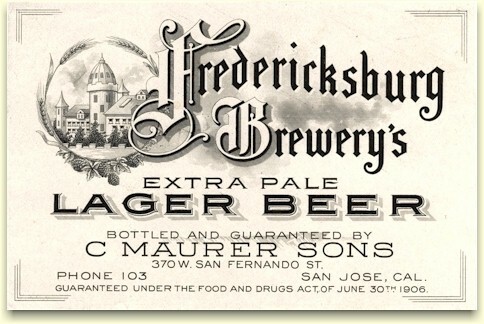 A Sept. 1883 newspaper ad stated that the Brewery was offering a "...Genuine Salvator, Pilsner, and Bavaria Lager Beer." In addition, a 1894 Directory listing stated that they were "Brewers and Bottlers of Extra Pale, Pilsner, Pschorr, and Culmbacher beer." As early as 1878, the brewery established an agency in San Francisco at 621 Brannan St., but it's not clear who did the bottling. In 1880 the agency relocated to 539 California St. The brewery also established a bottling depot in Los Angeles, in 1886. It's proprietor was E. C. Schnabel, son of Ernest Schnabel, the brewery's co-owner and manager. Also in 1886, the brewery used both the Postel Brothers (Arnold & Rudolph), and the Lang Brothers (Otto, Leonard & August) as local bottlers. 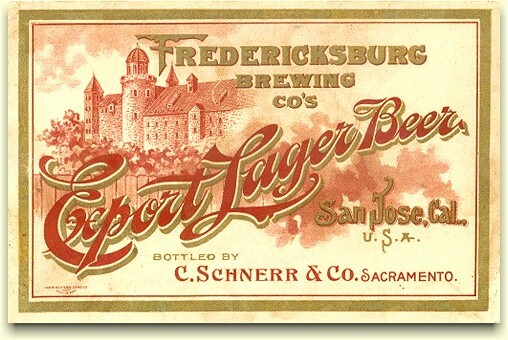 The following year, the Lang Bros. were the sole bottlers of Fredericksburg beer in San Francisco. This began a long term, business relationship, and the establishment of the Fredericksburg Bottling Co. The following is a vivid, first-hand account of a brewery tour found in Pen Pictures from the Garden of the World, published by the Pacific Press Publishing Co., Oakland, Cal., 1888. "Embarking on one of the handsome cars of the Electric Road we are whirled rapidly along the famous Alameda Avenue, with its leafy shade, past the homes of wealthy men, sheltered with giant trees and embowered in flowers, to a point where stirring life and bustling activity proclaim the presence of some great enterprise. It is the Fredericksburg Brewery, the widest known and the most extensive establishment of its kind west of the Rocky Mountains. from whose junction is now rising a lofty, commanding center, to be, when finished, of three stories, constructed in the strongest manner, and, as is shown by the plans (drawing above), an elegant structure. It is the new brewhouse. In it will be placed a new copper beer kettle, of a capacity of two hundred and twenty-five barrels, also an iron mash tub with copper bottom, an immense hop-jack, hot-water tanks, etc., all of the best construction and manufactured by the George F. Ott Copper and Iron Manufacturing Company, Philadelphia. In the malt-house the curious visitor will see the enormous vats wherein is soaked the barley, the vast stone cellars where it is placed to sprout, the chambers for drying, and the mills for grinding, some slight conception of the magnitude of all these operations being obtained when it is remembered that seven tons per day of barley are transformed into malt. machinery of the establishment, its lifting, and pulling and pumping, its mills, its elevators, and its enginery. There are in all ten pumps, all necessarily of great power, employed in the establishment, forcing the beer in the different stages of its manufacture to the various parts of the building. Pure artesian water is supplied from two artesian wells. One of the most interesting departments is the refrigerator room, where two engines of forty-horse power each are kept busy in the manufacture of ice, the capacity being over fifty tons per day, and in forcing salt water, cooled beneath the freezing point of fresh water, through the storing rooms. The pipes containing this water are enveloped in a constant coating of ice, presenting a strange appearance as one comes upon them after the genial atmosphere of out-of-doors, or the torrid heat of the engine-rooms. The storage cellars present a sight that will not be easily forgotten, range after range of giant tanks and vats and casks, containing each from thirty-five to two hundred and fifty barrels of beer. The fermenting room, with its long line of frothing vats, when the beer is preparing for the storage cellars, the filters, the great ocean of cooling ship — but why attempt to describe the indescribable? It must be seen to be appreciated, and in despair we abandon the attempt to picture in detail. watching the curiously capped bottles that are under-going the process of Pasteurization, the exquisite finish of the clear and beautiful Pilsener and Culmbacher lager beers prepared for export; and after it is all over he will quaff with a new appreciation the nectar of the crystal clear and wholesome beer presented at the hand of the genial F. A. Baumgartner, the foreman who has done the honors of the establishment by accompanying him through. These latter departments occupy commodious wooden buildings distinct from the main brewery, and are admirably fitted. To help the imagination, it must be known that from eight thousand to ten thousand bottles per day are required, these bottles being made some in Illinois and some in Germany¹ (right), and the annual production has risen from the very small beginning made in 1869, to a grand total of fifty-three thousand barrels from May to May last year, and a probable sixty thousand during this present year, ending 1889. In all some one hundred and twenty men, women, and children find employment, the wages paid and the hours of work having always been eminently satisfactory. In San Jose fifteen horses are needed for the wagons, and a like number are used in connection with the San Francisco business. The brewery is connected directly by an independent switch with the Narrow Gauge Railway, a material advantage when it is considered that shipments upon an immense scale are required to fill the growing demands from Central and South America, Old and New Mexico, Japan, Australia, the Sandwich Islands, and the most distant portions of the Pacific Coast States and Territories, in addition to the large and firmly established local trade. This great business was inaugurated on a very small scale in 1869, and has steadily prospered, until now, under the efficient management of its proprietors, Messrs. Ernst Schnabel and Ernst A. Denicke, the business is unsurpassed, Mr. Schnabel is the manager of the brewery at San Jose, and his watchful oversight the direct cause of the purity and excellence of the beer, while Mr. Denicke resides in San Francisco and manages the outside business. 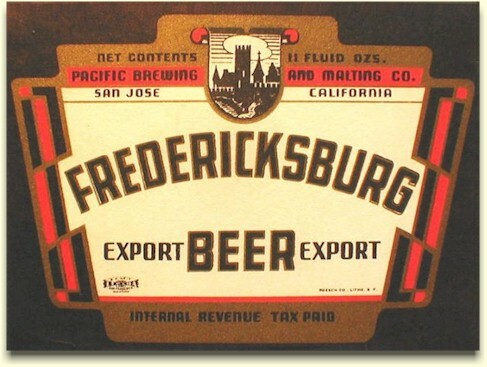 They possess ample capital, and, backed as they are by long and successful experience, and untiring energy, the Fredericksburg Brewing Company constitutes one of the most important commercial institutions of the State." Prior to 1890 the bottling shop had to be (as stated above) "distinct from the brewery". The bottling works handled the bottling of beer for export to foreign countries, and for local consumption. Beer destined for other west coast markets was sent in kegs to local agents who distributed the beer that they bottled, or had bottled by a separate plant. The use of bottler/agents continued until national Prohibition put a stop to everything. Some of the other west coast bottlers were: the Oakland Bottling Co. in Oakland, Cal. (above); J. R. Luttrell & Son, San Diego, Cal. ; H. Loose in Lovelock, Nev.; C. E. Roos in Seattle, Wash.; Hoefer & Mevius in Redding, Cal. ; H. C. Heidtmann in Reno, Nev.; Kalamath Falls, Ore. (below); and C. Schnerr & Co. in Sacramento, Cal. (further below). Upon completion of the 1888 brewery expansion, the brewery was adorned with impressive spires and crenellated turrets. 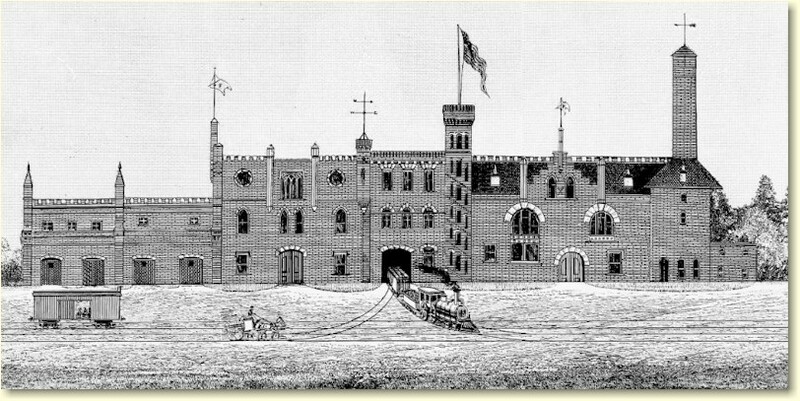 It looked more like a German Rhine castle than the brewery envisioned in the architect's plans (above). These distinctive architectural elements became the brewery's trade mark, and appeared on their labels, letterhead, and all other promotional material. 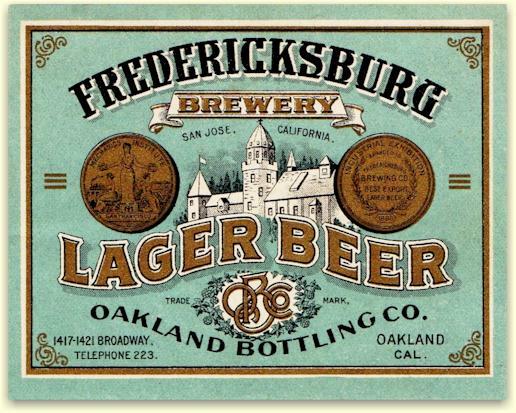 The style was also adopted by the Lang Bros. when they built their bottling works in San Francisco, which would suggest that the Fredericksburg brewery was a principal in the bottling plant. 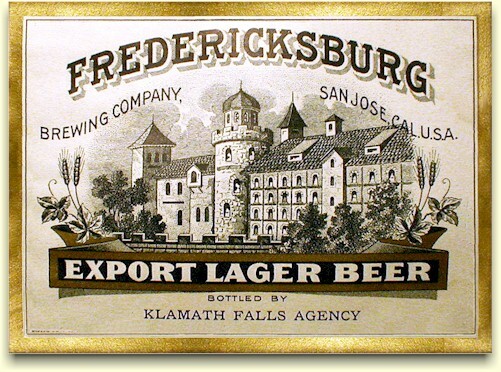 In 1890, controlling interest in the Fredericksburg Brewery was purchased by San Francisco Breweries, Ltd. This British syndicate was formed to acquire and amalgamate ten breweries in and around San Francisco. The combine consisted of the Fredericksburg and Pacific breweries of San Jose; the Hofburg Brewery of West Berkeley; the Oakland Brewery, and Brooklyn Brewery, both of Oakland; the John Wieland Brewing Co., the United States Brewery, Chicago Brewery, So. San Francisco Brewery, and Willows Brewery - all of San Francisco. By 1899, four of the breweries had been liquidated. Of the six remaining, the April 1906, San Francisco fire and earthquake destroyed three. The Syndicate lasted until Prohibition with only the Fredericksburg Brewing Co., John Wieland Brewing Co., and the Brooklyn Brewery. The post earthquake rebuilding in San Francisco brought other changes to the cities breweries. They were now updating and installing their own crown cap bottling lines, and the beer bottling unions were demanding the end of embossed bottles and the use of patented stoppers. 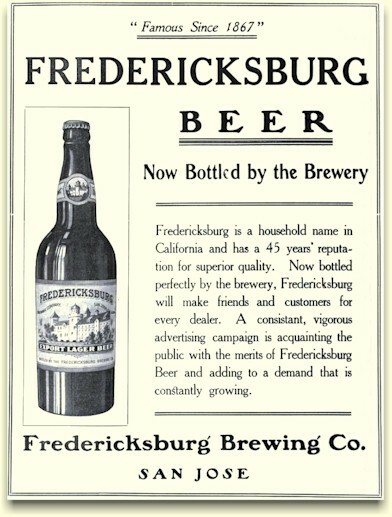 It's not clear which happened first, but in May of 1912, the Fredericksburg Brewing Co. announced that their beer was now "bottled by the brewery". Not at the brewery, but by the brewery, which would indicate that they were now the proprietors of the Fredericksburg Bottling Company. Also in May of 1912, August Lang & Co. released their own "Red Lion Beer" from the Aug. Lang Brewing Assn. at Baker & Geary Sts. Lang may have sold to S. F. Breweries, Ltd. to fund the refit his newly acquired brewery. The bottling works continued operating as the Fredericksburg Bottling Co. until late 1918. The Fredericksburg Brewery didn't quite make it to Prohibition in 1920. San Jose voted to become "dry" in 1918, in part as a WWI conservation effort, which was actually a thinly veiled prohibition movement. In September, 1918, the Brewery ceased operations. 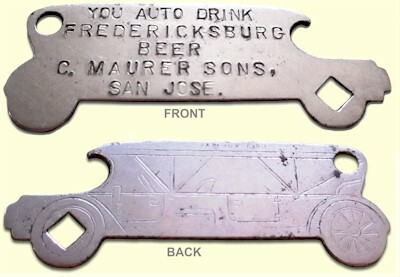 During the years of Prohibition (1920-1933) many breweries continued operating by producing near-beer or soft drinks, but the Fredericksburg plant remained shuttered until Repeal in April of 1933. In 1916, Huth & Virges of Tacoma's Pacific Brewing & Malting built a brewery in San Francisco, after being shut-down by Washington's state-wide Prohibition. The SF brewery, located at 675 Treat St., operated under the name Tacoma Brewing & Malting, but was also doing business as Pacific Brewing & Malting. 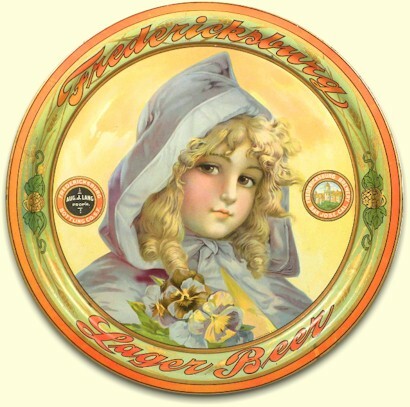 In 1918, the government impossed a war time restriction on breweries, which prompted PB&M to convert the Tacoma plant to soap manufacture, and to sell the San Francisco plant. The SF brewery was sold to a group of investors led by the plant manager and company shareholder, Charles Colpe. On 1 Dec. 1919, the brewery began doing business as the Tacoma Brewing Co., and continuing with the production of near-beer. In 1927, after eight years of struggling, and with no hope of an end to Prohibition, Colpe sold the Treat St. brewery to the Rainier Brewing Co. 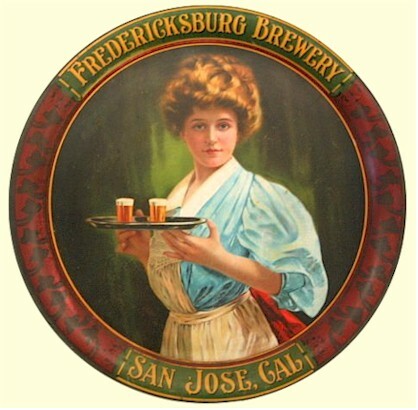 However, five years later the end of Prohibition appeared emanate, prompting an investment group of SF capitalists, headed by Charles H. Colpe, to purchase the shuttered Fredericksburg Brewery. In July of 1932, Colpe was quoted as saying that the brewery will re-open with the manufacture of malt, but will be used immediately for brewing beer should the Volstead act be modified. Colpe and his group had additional plans for expansion outside of San Jose. "Believing that the United States will see legalized beer by June 1, the old Tacoma Brewing Company, once one of the largest brewing concerns on the coast, came to life yesterday under a new name. As the Pacific Brewing and Malting Company of San Francisco, it filed articles of incorporation with the Secratery of State at Sacramento. Its capitalization was placed at $2,000,000. The directors named in the articles were the former owners of the Tacoma Brewing Company, Charles H. Colpe, Henry E. Monroe, H. W. Steineggner, J. M. Early, and W. J. Wilson, all of San Francisco. According to Colpe the concern will take over the Tacoma Bottling Company plant at Sacramento, the Tacoma Bottling Company in Los Angeles, and the Fredericksburg Brewery and Malt House at San Jose, to be operated as plants by the new concern. The development program includes certain changes, additions, and developments in the three major plants of the company to meet an anticipated rush business when a legal thrist armistice is declared." The new brewery's president wasn't entirely successful in his negotiations with Rainier. 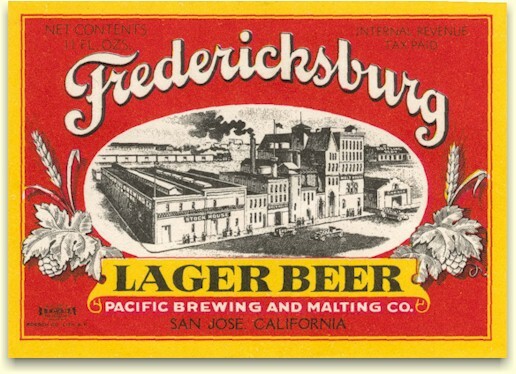 While he had secured secured use of the Fredericksburg brand with the purchase of the brewery, he failed to regain rights to use the Tacoma brand. 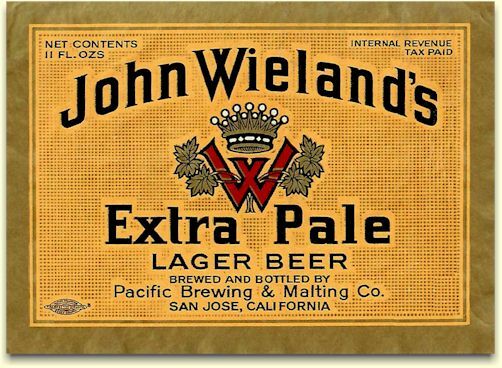 However, he did manage to obtain the rights to an historic San Francisco brand - Wieland's. 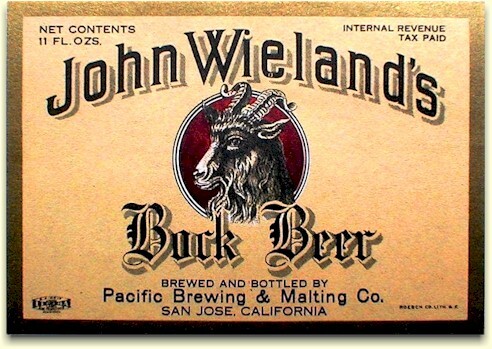 Pacific Brewing & Malting operated until 1951, when it became the Wieland's Brewing Co. But before a years time the brewery was purchased by the Griesedieck family of St. Louis, making it their western branch of the Falstaff Brewing Corp. The plant closed permanently in 1973 and was demolished in 1980. ¹ Similar bottles to the one shown above were used by the Claussen-Sweeney Brewing Co. and the Bay View Brewery, but with green glass. This confirms what has long been suspected by collectors - that these bottles were made by the Siemens-Glaswerks of Dresden, Germany, the largest bottle manufacturer in Europe at the time (ca.1887). The Fredericksburg Bottling Co. quart, in green, is also believed to have been made in this Dresden glass factory, but at a later date. ² The Prest-O-Lite key is the square hole in the at the end of the cap lifter which was used as a wrench to open the valve on carbide tanks mounted on the running boards of early autos. Headlights were illuminated by carbide gas from about 1900 to 1915. 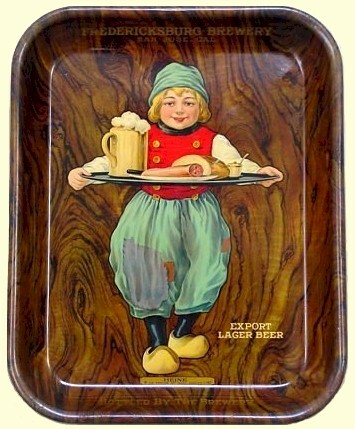 12" stock tray by H. D. Beech & Co.
13" beer tray by Kaufmann & Strauss Co.
stock tray by American Art Works "Heine"
To Diane Garland for the Fredericksburg label from the Reno bottler. And to the estate of Leota Jett for her figural (auto) cap lifter. Copyright © 2011 ~ All Rights Reserved.